Olive oil, a staple of the Mediterranean Diet, is an incredibly healthy oil – full of ‘good’ fats and antioxidants. But olive oil doesn’t just make a delicious salad dressing, it can be used in countless other ways making it well deserving of a place in your medicine cabinet, beauty routine and home. Here are 29 uses for olive oil outside of the kitchen. Keep a bottle of olive oil on hand for minor ailments and to benefit your overall health. A build-up of ear wax can be annoying – impacting your hearing and leaving you more prone to infection. If you suffer from excessive wax, olive oil is an inexpensive and effective treatment. Swimmers’ ear, an infection in the outer ear canal which is often brought on by water that remains after swimming, can easily be prevented by adding a few drops of olive oil to each ear before jumping into the pool. If your ear problems develop into a full blown infection, before reaching for the antibiotics (which can often have unwelcome side-effects) try some olive oil. When coupled with the healing power of garlic, olive oil has been used for centuries to treat ear infections. For immediate and long-lasting relief from pain, heat two tablespoons of olive oil with one clove of minced garlic over a low heat for 20 minutes. Discard the garlic and allow the oil to cool before adding 1-2 drops to the afflicted ear. Again, do not use if the ear drum is ruptured. Gently apply olive oil to sunburned skin for relief and faster healing. Olive oil contains certain compounds that act as antioxidants which help prevent and repair damage to the skin caused by accidental sun exposure. According to Dr. John Deane, these compounds have been compared to other antioxidants such as tocopherols, which are commonly used by the cosmetic and pharmaceutical industry to prevent skin damage. Make sure to check out these other home remedies for sunburn too! An ancient Ayurvedic practice, oil pulling involves swishing oil in your mouth upon waking, in order to improve oral hygiene, energy levels, immune function and so much more. While coconut oil is the most popular oil for this – mainly for taste reasons – olive oil can easily be used in its place as an equally effective alternative. Learn more about oil pulling and how it can benefit you here. 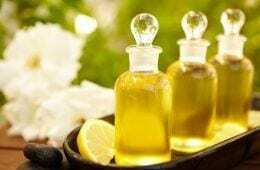 A mixture of olive oil combined with certain essential oils (like eucalyptus, lavender, rosemary, thyme or tea tree) can be massaged topically onto sore throats to help stimulate both circulation and lymphatic drainage, which works to reduce inflammation and pain. Mix 20 parts olive oil with one part essential oil and rub in. Cover with a blanket or heating pad to boost healing. Here are 21 other home remedies to cure a sore throat. A common, itchy skin problem which affects many babies, cradle cap can be prevented or cured with the regular application of olive oil. Try applying a little oil twice a day, and allow to sit for a few minutes before brushing off the flakes. Because olive oil is moisturizing and anti-inflammatory, it’s one of the best cures for diaper rash. It also creates a barrier between the skin and urine or feces, so can prevent rashes from forming in the first place. Mix one teaspoon of olive oil with two teaspoons of water and whisk until you get a creamy texture. Apply this directly to the skin and allow it to dry completely. You could also add a drop or two of lavender essential oil before applying for added anti-microbial effects. Cracked heels aren’t just unsightly – they can be painful, especially if they begin to bleed. Combat this common summer condition by applying olive oil to the heels every night before bed. Make sure to wear socks so the oil can really do its job (and avoid rubbing off on your sheets). Not only is olive oil one of the most effective natural remedies for head lice (it acts as a suffocating agent), but it comes without the risk of chemical alternatives. Apply the oil liberally over the head and work it through the hair. Cover with a plastic wrap, then shower cap, then towel and leave on overnight. In the morning, comb the hair with a metal comb (using a bowl to catch the material as it comes off). Keep combing the hair to remove as many nits as possible, then wash with shampoo. Olive oil suffocates the lice, but not the eggs, so the process needs to be repeated several days later until all nits are removed. Anti-inflammatory olive oil has been found to be more effective than medicated cream when rubbed into sore joints! Thirty women with osteoarthritis of the knee used either the medicated cream, or olive oil for four weeks. Those using olive oil reported less pain and greater physical function than those using the cream, and these benefits were seen within just 2 weeks! Regular massage is helpful for reducing stress, pain and muscle tension, anxiety, digestive disorders, headaches, sleep problems, soft tissue injuries and joint pain. In fact, massage is an important tool for maintaining good health. Olive oil plays a role in this good health by acting as an economical carrier oil for homemade massage oils. Here is all you need to know about making your own all-natural massage oils using olive oil. Olive oil doesn’t just do wonders for our health – our furry children can benefit from it too. Add it to your dog’s food to help his joints as he ages, prevent cognitive decline, and benefit his skin and coat. The oil can also be used topically for dry skin. Cats can take 5 to 10 drops of olive oil with food daily to prevent constipation and hairballs and to ensure supple joints and a glossy coat. You don’t have to spend a fortune to look good – a bottle of olive oil is so versatile you can use it for many of your personal care needs. We cause damage to our hair every single day – when we sleep, when we shower, when we style it and when we work out. Offset some of this damage, and prevent dry, broken or split hairs, by applying a regular nourishing olive oil mask. Gently heat a half cup of the oil, apply to the hair and cover with a towel. Let sit for 30 minutes (or overnight), then shampoo and thoroughly rinse. Known as the ‘oil-cleansing method’, using an oil to remove dirt and make-up is highly effective for beautiful skin. Once your face adjusts to this new routine, you should enjoy skin free of excess oil, dryness and blackheads. Take a tablespoon of olive oil, massage into your face and neck for two minutes, and wipe off with a washcloth soaked in hot water. That’s it – you don’t even need to apply a moisturizer after! DIY beauty enthusiasts should always keep a bottle of high quality olive oil on hand to whip up a variety of all-natural pampering products! Whether you need to mix up a face mask, lip balm, eyeliner, natural blush or soap recipe, olive oil is always called for! Using olive oil to treat acne is based on the same principles as the ‘oil-cleansing method’ – it will provide a deep cleanse and draw excess sebum out of the pores, while reducing inflammation and restoring natural moisture. Many swear by mixing salt with the olive oil to kick things up a notch in the fight against acne. Make a paste of four tablespoons of salt and three tablespoons of olive oil. Work into the face before wiping off. Proponents of this method claim, done twice weekly, this method offers a noticeable improvement in acne symptoms. Swapping store-bought shaving cream or foam for olive oil is a cheap and convenient move that leaves you with a close shave and soft skin. Simply rub the oil into the skin and shave as you normally would. Using olive oil in nail care is an age-old treatment that really works. Brittle nails are caused by over-drying of the cuticle and nail bed, but daily application of olive oil will solve all that…leaving you with strong and shiny nails. Olive oil doesn’t just cleanse your face – it works on your make-up brushes too, an important weekly routine to get into if you’re looking for glowing skin. Mix two parts soap with one part olive oil. Wet your brushes with warm water and massage the oil mixture in before rinsing the brushes thoroughly and allowing to air dry. The Italian actress Sophia Loren swears that olive oil baths are the secret to her glowing skin. Just add five tablespoons of extra virgin olive oil to your bathtub, sit back and enjoy. Mix used coffee grounds with a little olive oil and massage onto areas where you are suffering from cellulite. Repeat this treatment for ten minutes twice a week – you should notice results in just four weeks. Have a read of this article for even more natural cellulite treatments. Don’t waste your money on expensive anti-stretch mark oils – regular olive oil application is just as effective thanks to its vitamin E and antioxidant content. A few drops of essential oils mixed in will also help speed healing – sage, rosehip, lavender, neroli and patchouli are all good choices for fading stretch marks. Steer clear of chemical-laden spray polishes for your wooden furniture. Instead, mix up one cup of olive oil with a half cup of freshly squeezed lemon juice and apply with a very soft cloth to naturally clean and polish hardwood furniture. Working hard around your house? It’s inevitable that you’ll end up filthy while your home gleams! To remove stubborn grease or paint marks from your skin or hair, massage in olive oil before rinsing the oil and dirt away. WD-40 is useful to have on hand for those annoying squeaky doors, but it doesn’t smell great! For a natural, and more pleasantly scented alternative, apply a few drops of olive oil to the hinge and enjoy the sound of silence once more. Another easy fix is to use olive oil as shoe shine – it works like a charm. Apply the oil to your shoes and buff with a cloth until you can see your reflection in them! Scented candles can often be harmful for your health. Not these two-ingredient candles through – made with edible products. All you need is an orange, some olive oil and two minutes! Cut the orange in half, remove the flesh (but leave the pith/wick intact). Add some olive oil and light the ‘wick’. It will burn for up to an hour. A few drops of orange or cinnamon essential oil will give an even more delightful aroma.